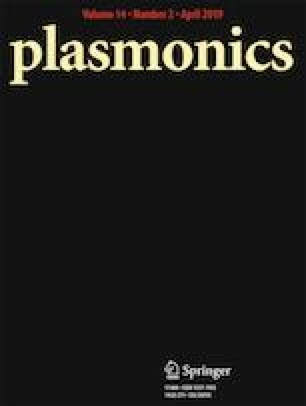 This study presents a theoretical calculation for the surface plasmon polariton near-field assisted modification of non-linearities of a three-level quantum system placed on top of one-dimensional gold grating structure. The strong coupling of intense electromagnetic near-field, tightly confined at the interface of dielectric-metal grating, can dramatically influence the higher orders of non-linearity of a quantum system placed in the vicinity of grating. We have obtained a full solution of the three-level quantum system problem in our previous study (Gupta et al. J Opt 18(10):105001, 2016). It can, however, be advantageous to focus on the effects of specific orders of the polarizabilities, particularly at lower intensities of light. It then becomes easier to identify the various effects of the non-linearities on a light probe. In this work, I focus on the χ(3) non-linearity of a given active medium. Prince Gupta acknowledges Professor S. Anantha Ramakrishna and Professor H. Wanare for their insightful comments and discussion and for providing the facilities to perform the calculation.